The weather was nice one day in northern California, so a couple took their dog for a walk. They left their house as a regular pair of middle-class Americans. When they returned home, they were multi-millionaires. The woman noticed the edge of a rusted can sticking up from the ground and dug it out to get a closer look. Inside they discovered a hoard of 1,427 gold coins totaling $10 million. Incredibly, the coins were uncirculated and in mint condition dating between 1847 and 1894. 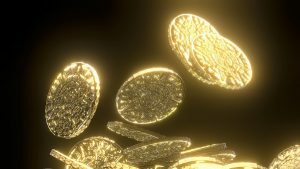 They find, so rare, captured the attention of one gold expert who explained, “you don’t get an opportunity to handle this kind of material, a treasure like this, ever.” In fact, some believe this represents the largest single find of gold coins on U.S. property in history. Many of the coins carry $5, $10 and $20 denominations, however, now, so many years later, their worth has skyrocketed. This year a woman, out for a hike in Israel, came across a glimmer in the soil. That little glint was a coin so rare that experts believe there is only one other like it in the world. “The coin was struck by Roman Emperor Trajan in the year 107,” reported NPR. One side shows Augustus, the founder of the Roman empire. On the other side are images symbolizing Roman military legions. The piece was most likely used to pay a soldier. However, such a large, single payment was less desirable to the Romans. Due to its value, it was difficult, at the time, to use the coin for everyday purchases because it was so difficult for merchants to make change. Sadly, the woman was unable to sell the piece. Instead, she was asked to hand it over to The Israel Antiquities Authorities so it could be put on public display. Sometimes the thrill of a gold find carries surprisingly dark overtones. This was the case when archaeologists made a recent discovery on an island in the Baltic Sea. The location was the site of a mass murder occurring in the 5th century. The coins at the site have led some to theorize that the attack was motivated by a desire for the valuables held by the inhabitants. Atlas Obscura explains that “The face of the coin depicts Western Roman Emperor Valentinian III, who ruled between 425 and 455, with his foot crushing the head of a barbarian.” Others, however, question that the attack was purely for financial gains as many other precious items, like gold rings and bracelets, were also left at the site untouched. Moreover, details of the mutilations seem particularly personal. For example, archaeologists found several skeletons with their mouths stuffed with either goat or sheep teeth. Want to get rich? Apparently, all it takes is a ladder and a wheelbarrow. In March of 2017 thieves broke through bulletproof glass at the Bode Museum in Berlin, Germany and stole a single gold coin. Why would burglars face so much risk for just one coin? Because it’s one big coin. It weighs 220 pounds and is 99.999 percent pure gold. It's worth over $4 million. Police are uncertain how the group was able to evade the alarm. It’s believed that the coin has been melted down into bars to further elude authorities. Recently, four suspects were arrested. However, police have not recovered any gold.